With the concept plan complete, the city and the community will soon begin working on design plans. The draft concept plan for an 18-mile greenway trail encompassing the city of Hillsboro will soon make its way to the city council for adoption, and some work for the decades-long project is already underway. 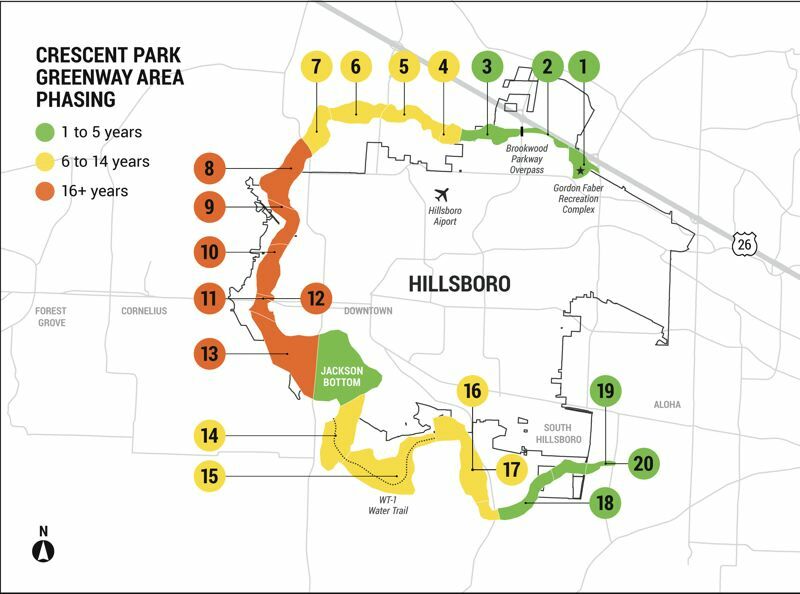 Planning began in 2015 for the Crescent Park Greenway — a collection of natural areas, parks, and trailheads connected by green spaces and tied together by trails — as a means for developing a unique outdoor asset for Hillsboro's community. While small portions of development of the greenway have already begun, approval of the concept plan is needed before further plans for design and development are made. The long-term project will help to connect several current city parks, including Dairy Creek Park, the Gordon Faber Recreation Complex, Jackson Bottom Wetlands Preserve and Rood Bridge Park. The trail system could include spurs to access parks and other locations away from the main greenway section. Planners say the trail system will provide community members and visitors a unique way to spend time outdoors and be able to maneuver around the city in a more natural way — while at the same time maintaining the city's natural space. Years of farming and development in the city have left natural spaces somewhat ignored, project manager Ryan Stee said, which has disrupted local wildlife. The greenway is expected to help to restore a lot of the natural systems, he said. "There's a lot more happening in a greenway, it's not just a trail," Stee said. "(There are) natural systems, and stormwater and actual critters that will use the space to move around the urban area." The greenway would help protect some of those critters, specifically in surrounding creeks, by maintaining the natural systems and preventing urban development from getting too close to the creeks, he said. The greenway is expected to wrap around Hillsboro's edges in the shape of a crescent and would follow the varied waterways around the city, beginning near Ron Tonkin Field and following the stream past Top Golf to the west. This section of trail would include a pedestrian bridge to ease the crossing of Brookwood Parkway. The trail would meet up with McKay Creek and follow it to the south, where it eventually empties into Dairy Creek and eventually, the Tualatin River. At Jackson Bottom, trail users could either take a pedestrian trail or hop into a kayak at a new paddle launch and traverse the river down to Rood Bridge Park. The trail would then wind along with the river before cutting through South Hillsboro. 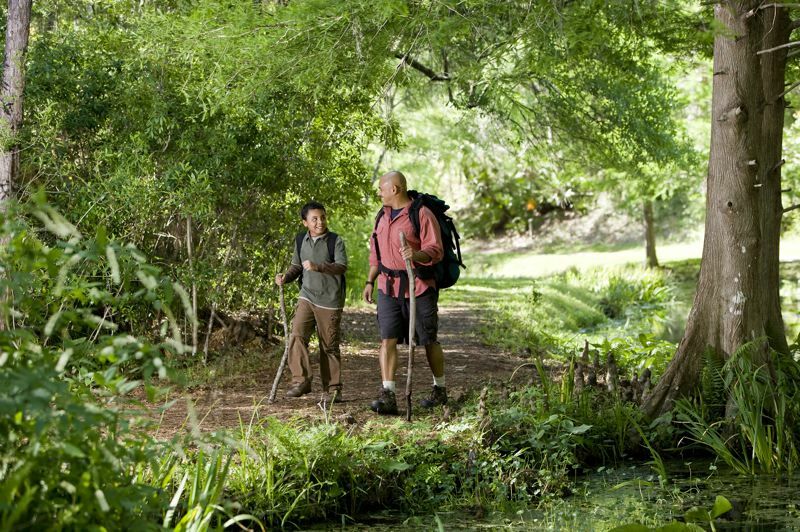 The greenway will include stream corridors, natural areas, and recreational amenities such as trails and trailheads, picnic shelters, signage and other facilities. Part of the plans for the project include showing the juxtaposition that is Hillsboro, Stee added. As people travel along the trail through north Hillsboro, the signage, trail surfaces and surroundings will represent a more urban feel — with north Hillsboro being designated the industrial region of the city. As they continue on to the more rural areas along the agricultural edge, the greenway will represent just that — giving community members and visitors alike a feel for all the city has to offer. "So we've created settings that honor that landscape and provide a buffer between urban development and rural activities," Stee said, "as well as providing people with an opportunity to see the agricultural landscape and the rural landscape differently." A portion of the trail in south Hillsboro has already been completed, and more is expected to begin in both the south and north areas soon as development continues. Stee expects roughly 5 miles of the greenway to be completed in the next 5 years, he said. Following recent public comment, the concept plan will be taken to the Hillsboro Parks and Recreation commission on Jan. 22 for their adoption of it, Stee said. It will then go to City Council in February for a formal adoption by resolution. After that, more robust public outreach will take place as planners will work with the project's advisory committee and community members on the design of the greenway, deciding where portions of the trail will go, how to best utilize the space, how it will be implemented and when, and more. It's a highly anticipated project, and one that Stee and many others are excited about. "It's our version of Central Park," he said. "It's going to be this iconic, 18-mile loop around the city that just hugs the city, and it's a place where we have all this development and people can step away for a moment and get some nature. ... This is an opportunity for us to have a public space that really makes sense for the direction the city is heading into."